MISSION VIEJO -- It was a tale of two days, two separate meets, and two different style of headliners. That's a simple summary for an event that shined in its complexity. The 29th Trabuco Hills Invitational & Distance Carnival was a showcase of Upland's speed and depth during's Saturday's day meet while Friday's distance showcase was a stage for Mikaela Ramirez to again run out front -- but not in the race you'd expect -- and Maria Hernandez to do the same in the event Ramirez owned the week before while an emerging Frosh/Soph star, Zoe Smith, had her own record-setting solo tour in the spotlight. Again, simplicity where complexity reigned. 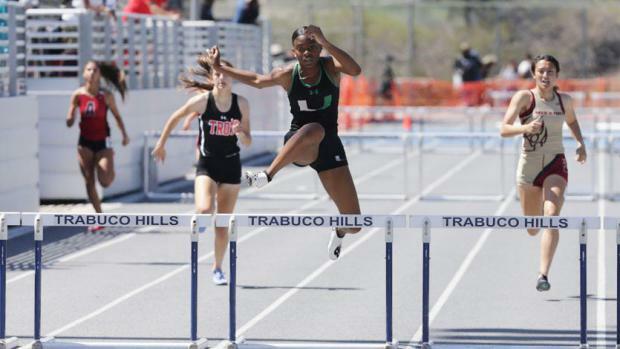 For Upland on Saturday, freshman gem Caelyn Harris, who burst onto the scene with impressive marks at the California Relays two weeks ago, showed off her hurdler/jumper versatility at Trabuco Hills. First with a victory in the 100 hurdles, running 15.10 to separate herself from a photo-finish battle for second between Trabuco Hills junior Kiana Stradford (15.382) and La Mirada senior Citlalli Anguiano (15.387). Harris (Frank Bellino photo) came in with a best of 15.03 that ranks No. 1 in the state in the class and No. 11 nationally for freshmen. Harris, who came in with a U.S. No. 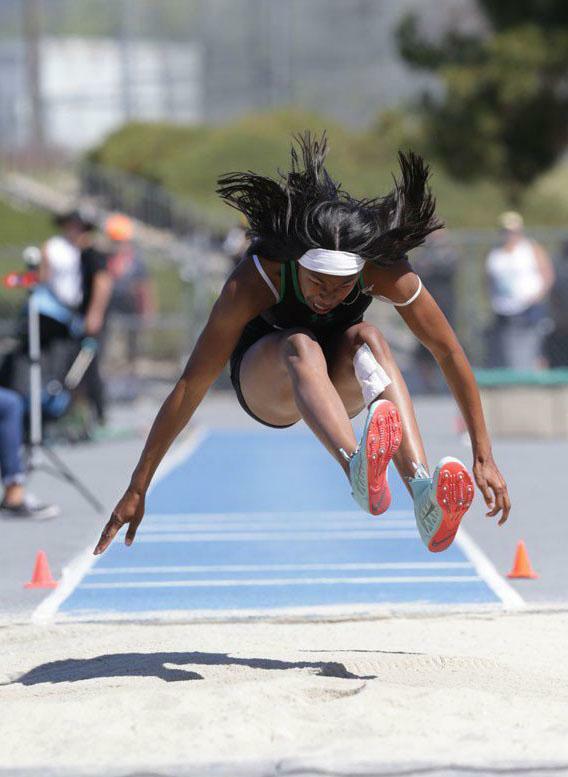 5 all-conditions long jump of 20-2.50 from the California Relays, was almost as impressive on Saturday, jumping to a meet-record of 19-11, with the official wind reading at 0.0. Junior Kerrington Smith won the girls triple jump 40-00. Sophomore Demia January was third in the 300 hurdles (44.91/CA No. 12). Sophomore Jailen Burrell won the boys long jump (22-01). Junior Namir Hemphill won the boys triple jump 48-1.50 and was second in the 300 hurdles (38.68). And then there was senior Caleb Lutalo Roberson. Roberson, the defending State Meet champion in the 300 hurdles, and a football signee to Wyoming, used Trabuco Hills to focus on speed work. It was a year ago that he showed great promise in the 300 hurdles despite a battle of a race to victory (38.22). The thought then was if he could clean it up, sky's the limit. This of a guy who went to State in the long jump as a sophomore but then opted to stop jumping to focus on sprints and hurdles. 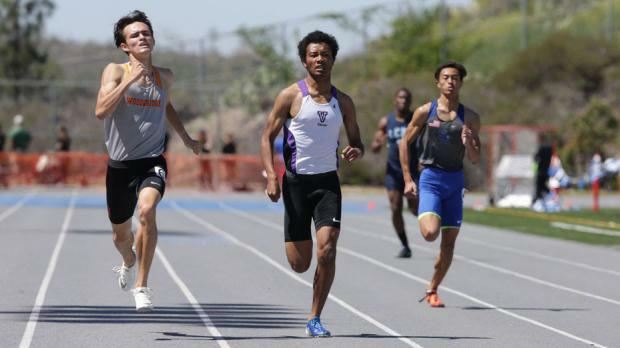 So on Saturday, with a huge 300 hurdles racing looming a week later at Arcadia, he battled one of the state's elite sprinters in the 100 and put on a show in three other races, winning the 200m and running a leg on the winning 4x100 and 4x400 relay teams. 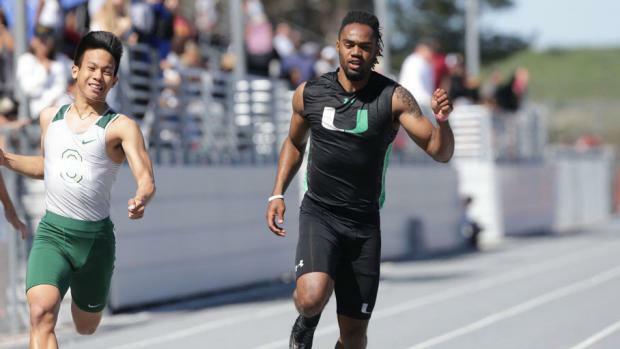 In the two-day meet's final event Saturday, Roberson ran lead-off and Hemphill took the anchor as Upland won the boys 4x400 relay in 3:24.59. Hemphill's surge over the final 80 meters was the difference in the victory over Leuzinger (3:26.97). Despite shaky handoffs, Upland still put down a 42.19 to win the 4x100 relay with Mission Viejo second (42.56) and Cathedral (SS) third (42.99). The boys 100 meters was one of the marquee events on a packed schedule and it didn't disappoint. 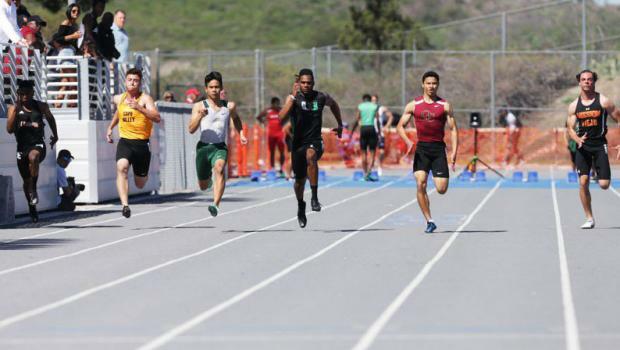 Moore ran 10.61 to win for the second year in a row despite a push from Roberson (10.83) and Ontario Christian senior Nolan Crespo (12.85). This is the only meet where Moore and Roberson have gone head-to-head in the 100m and Moore has won both times. Moore was a scratch in the 200 held much later in the afternoon and his presence may have been the difference between Roberson setting a meet record and simply tying it, which he did running a 21.28 PR. Crespo was second (21.87) and Cathedral senior Lennard Marshall was third (21.98). But enough about Upland. This was a meet with a record number of entries (3,586), athletes (2,355) and schools (95). 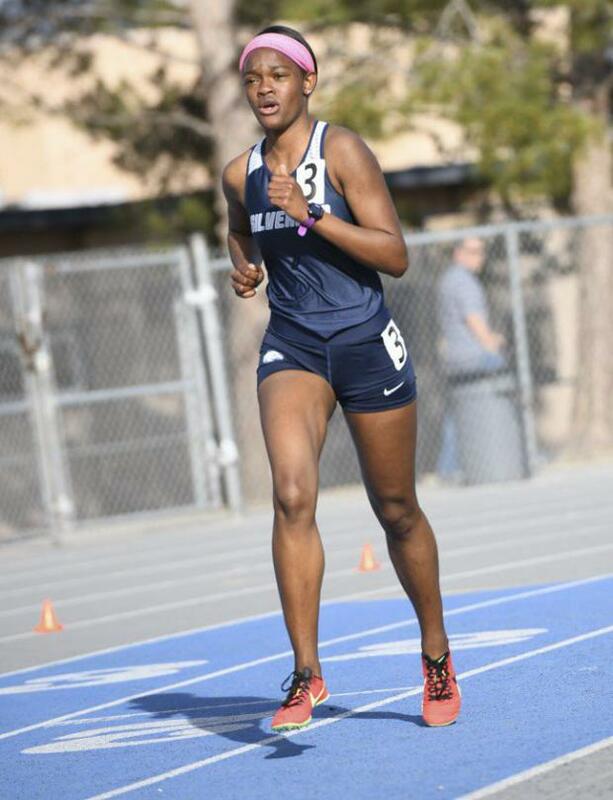 Among the non-Upland girls who shined on Saturday, Placentia Valencia junior Chrystal Aluya was first among them in blazing double-PR fashion. Aluya, a two-time Empire League champion in both sprints, won the 100 meter dash in 12.07 and the 200 in 24.72. In the 100, she held off Upland's Grady (12.11) and Santa Margarita senior Tessa Green (12.16). In the 200, Green was second (24.89) with Carson junior Ryan Lacefield, the defending LA City Section champion, was third (25.22). 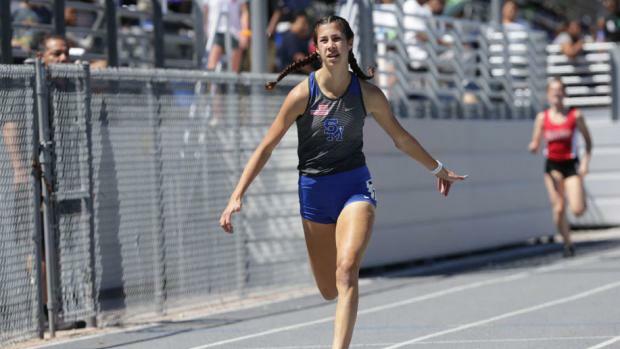 Santa Margarita sophomore Lauren Memoly (Frank Bellino photo) stole the show in the girls 400, going 55.85 to beat Citrus Valley sophomore Cienna Norman-Thomas (56.62), Woodbridge senior Milana Malec (56.69) and Carson junior Ryan Lacefield (56.93). In running the No. 8 time in the state so far this year, Memoly cut nearly two seconds off her previous PR. In keeping with the PR theme, Memoly went 18-8.50 for third in the long jump behind Harris and Redondo Union senior Mahkaia Lee (19-9.50). It was a 1-foot, 2.75-inch PR for Lee, who now ranks third in the CA (all-conditions) and tied for 11th U.S.
Paramount senior Drew Pickett had an impressive day, winning the 110 hurdles in 14.53 to stun favorite Anthony Taylor, a junior from Los Angeles Cathedral (14.60). That time ranks Picket No. 8 in CA all conditions and No. 7 wind-legal. Pickett later won his 100m heat in 11.22, the 10th fastest time among the 53 sprinters who posted a time at the meet, and his 200m heat (22.44) the sixth fastest time among 48 who recorded a time. Taylor, who has a CA No. 5 time of 38.22 in the 300 hurdles, came back toward the end of the meet to win that event (38.62) edging Hemphill (38.68) and Mission Viejo junior John Burns (39.18). Downey senior Jose Cisneros was a double winner in the boys throws, going 50-07.50 in the shot and 169-07 in the discus. Both were huge PR's for Cisneros, who broke 50 feet for the first time in the shot and had a 4-02 improvement in the discus with only his third throw ever in the 160s. Marina junior Alejandra Rosales won the girls shot put (38-10) beating Trabuco Hills senior Kyliegh Wilkerson (37-0). The places were reversed in the discus, with Wilkerson winning (138-06) and Rosales second (137-04). Friday's Distance Carnival included Frosh/Soph field events and elite invitational varsity races in the 800, 1600 and 3200 races. In the boys 800 on Friday night, Dorsey junior Christian Rodriguez ran a 1:55.72 PR for his fourth consecutive invitational victory in the two-lapper this season. It's a top-20 time in CA in 2019. Northwood junior Justin Larson was a close second (1:56.74). Sana Ana junior Maria Hernandez ran away with the 3200 race and broke 11 minutes for the first time, finishing in 10:52.53. Brea Olinda junior Whitney Valenti was a distant second in 11:02.64. Laguna Beach sophomore Mateo Bianchi won the boys 3200 in a PR of 9:25.60 in his first eight-lapper of the season. Redland East Valley junior Matthew Casillas was second in 9:27.20. 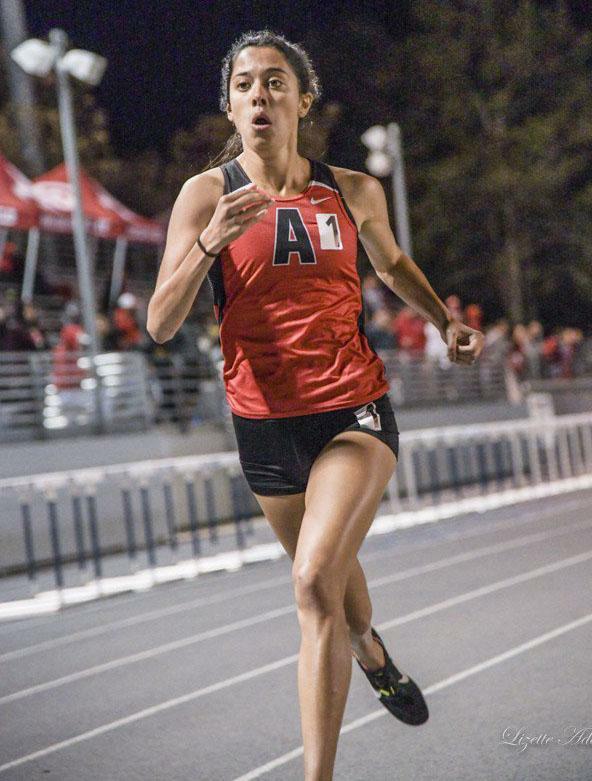 Redondo Union senior Isabella Landry created separation early and maintained that to the end in winning the girls 1600 (5:01.90) over Capistrano Valley junior Carly Corsinita (5:04.20) and Santa Margarita sophomore Kendall Saeger (5:06.64). In an all-San Diego Section battle in the boys 1600, Mission Hills senior Jonathan Velasco held off a late-charging Nader Ali of Crawford to win by .13 seconds. Velasco crossed in 4:20.37 with Ali coming hard at the end in 4:20.50. Friday night also had a pair of Frosh/Soph meet records. Silverado sophomore Zoe Smith won the 3200 in 11:27.13 eclipsing the 2013 mark of 11:34.86 set by Candace Batsford on Ayala. It was a big PR for Smith, who broke 12 minutes for the first time. Smith (Lizette Adams photo) came back to run 9:22.98 for second in the 1600, her second-fastest time at that distance. 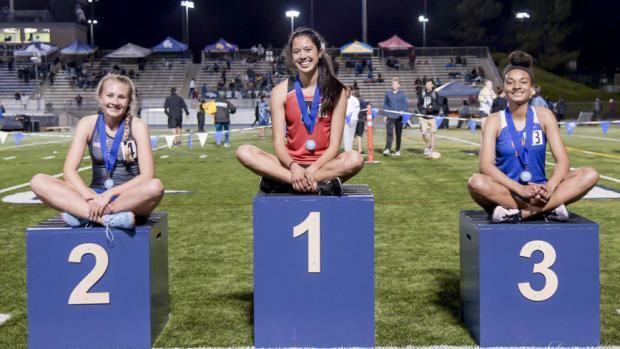 Ayala freshman Madeline Seifert won the F/S pole vault, clearing 10-9, which broke the 2011 mark of 10-8 set by Gardenia Centanaro of Roosevelt. It was a nine-inch PR for Seifert, who also has marks this season in the high jump and long jump. In the boys pole vault, Quartz Hill senior Daniel Palacio cleared 14-9 for the win and took three shots at 15-2, the first of which was a clearance ... until his pole knocked off the bar. In February, Palacio won the Winter Championship title with a clearance of 15-1. Marina senior Skyler Magula was second. Magula passed up to 14-3, which he cleared on his second attempt, but he was not able to get over 14-9. Capistrano Valley senior Jolie Robinson had a double-PR day, winning the high jump at 5-5, a two-inch PR, and placing fourth in the triple jump at 36-9, which matched her PR from two days before. In that girls 300 hurdles race, Mission Hills senior Maya Occiano was second in 44.79, which ranks CA No. 8. It wasn't, however, a PR for Occiano, who ran 43.67 for third in the San Diego Section Finals last spring. She also ran the 100 hurdles at Trabuco, placing fourth in 15.93, a PR and her first time under 16 seconds. Leuzinger won the girls 4x100 relay in 47.63 with Redondo Union second 47.72 and Upland third 48.01. Edison senior Aiden Garnett won the high jump over Rancho Alamitos senior Dayten Zepeda on misses after both topped out at 6-4. It was the ninth time in the last two seasons where Garnett has cleared at least 6-4. He's had three meets at 6-6, including two weeks ago to win at Laguna Beach Trophy Invitational. Quartz Hill was impressive in winning the girls 4x400 relay in 3:53.81, the No. 7 time in CA this season. Citrus Valley second 3:54.57 and Upland third 4:01.24.